The Death of General Wolfe is a well-known 1770 painting by Anglo-American artist Benjamin West depicting the death of British General James Wolfe at the 1759 Battle of Quebec during the French and Indian War (which was the North American theater of the Seven Years' War). It is an oil on canvas of the Enlightenment period. West made an additional and nearly identical painting of the same scene for George III of the United Kingdom in 1771. The Death of General Wolfe depicts the Battle of Quebec, also known as the Battle of the Plains of Abraham, on September 13, 1759. This was a pivotal event in the Seven Years' War and decided the fate of France's colonies in North America. The battle was fought between the British Army and the French Army; the pitched fighting lasted only fifteen minutes. The British Army was commanded by General Wolfe. Although successful in holding the British line against the French and winning the battle, General Wolfe was killed by several bullet wounds. In death, General Wolfe gained fame as a national hero. He became an icon of the Seven Years' War and of British dominance in late eighteenth century North America. West depicts General Wolfe as a Christ-like figure. This painting has a triangular composition, made by the top of the flag (as the apex) and the positions of the men. It resembles Christian "Lamentation" scenes, where Christ is held in the embrace of the Virgin Mary. Captain Hervey Smythe is pictured holding Wolfe's right arm. The depiction of the Indigenous warrior in the painting—kneeling with his chin on his fist, looking at General Wolfe—has been analyzed in various ways. In art, the touching of one's face with one's hand is a sign of deep thought and intelligence (thus Rodin's The Thinker). Some consider it an idealization inspired by the noble savage concept. Original items of clothing that were used as a model for portraying the warrior in the painting can be found in the British Museum's collection (as well as additional First Nation artefacts used in other paintings by West). On the ground in front of Wolfe are his musket, cartridge box, and bayonet. Wolfe went into battle armed as his men were, although his musket was of higher quality. His dress is also of note. He is wearing a red coat, a red waistcoat, red breeches, and a white shirt. Such dress was rather simple, especially for a commanding officer. Next to Wolfe, in the blue jacket, is Dr Thomas Hinde, who is attempting to stem the bleeding from Wolfe's wounds. The general later died in the doctor's hands. In the background, and to the left of the men surrounding Wolfe, an approaching runner is depicted. He is waving his hat in one hand to attract their attention, and with the other hand carries a captured flag with the Fleur-de-lis (a symbol of France)—symbolic of the news relayed to the dying Wolfe that the French were being defeated. The inclusion of Simon Fraser, Lieutenant Colonel of the 78th Fraser Highlanders (behind the man in green uniform, identified in the painting as Sir William Johnson) is interesting, as General Wolfe had always spoken highly of Fraser's regiment, yet Fraser was not at the battle, as he was recovering from wounds received earlier. In the painting, Fraser wears the Fraser tartan, which was probably worn by officers in that regiment. All in all only four of the fourteen men depicted were actually at the battleground. The clothing West depicted in this scene was highly controversial at the time. Although the event was relatively recent—only eleven years prior—its subject matter made it a fitting example of the genre of history painting, for which contemporary dress was unsuitable. During the painting, several influential people, including Sir Joshua Reynolds, instructed him to dress the figures in classical attire, and after its completion, George III refused to purchase it because the contemporary clothing compromised the dignity of the event. The work, however, eventually overcame all objections and helped inaugurate more historically accurate practice in history painting. The painting was originally exhibited at the Royal Academy in London, England. It was presented to Canada in 1921 as a tribute for its service in the First World War. William Woollett's engraving was the best-known copy of West's original painting and became popular around the world. A black-and-white copy of the engraving can be seen at Brodick Castle on the Isle of Arran, Scotland. Besides the original, at least four other additional versions of the Death of General Wolfe were also produced by West. The primary copy of The Death of General Wolfe is currently in the collection of the National Gallery of Canada, with further examples kept at the Royal Ontario Museum (as part of the Canadiana art collection) and the University of Michigan Museum of Art. The fourth copy produced resides at Ickworth House, Suffolk, England. Each reproduction had its own variation in the depiction of Wolfe's death. A fifth autograph copy was commissioned by George III in 1771 and is still in the Royal Collection. West's depiction of Wolfe's death in the midst of battle is figurative rather than literal. The painting, though widely celebrated, has also been heavily criticized in its historically inaccurate portrayal of Wolfe's death itself. For example, the stature of the observing Native American figure and the prominent figures surrounding Wolfe as he lay dying are a great example of artistic interpretation. There is no evidence that any figures surrounding Wolfe in the painting were actually present at his death. All the figures in the painting were senior military figures and would have been busy elsewhere in battle because Wolfe died at the height of the Battle itself and not after. However, West's choice to show General Wolfe's death in the figurative manner of a dying martyr, many compare to Christ, transforms Wolfe's death from a simple casualty of war to one of a hero that symbolized the British cause. Despite the fact that the painting is a more dramatized version of Wolfe's death than reality, West's work was groundbreaking for art of its time. Previously, contemporary scenes were painted in a Greek and Roman setting. Others advised West against using realistic eighteenth-century visuals such as modern costumes. Although Wolfe's death had already been painted by at least two other artists prior to West and those paintings also strove to portray Wolfe and his death in a more realistic style, the success of West's painting helped to further establish a new style of art that others had already begun to pioneer. Wolfe's death and the portrayal of that event by Benjamin West make up half of Simon Schama's historical work Dead Certainties: Unwarranted Speculations (1991). ^ a b Zygmont, Bryan. "Benjamin West's The Death of General Wolfe." Zygmon, Bryan. "Benjamin West's The Death of General Wolfe". Smarthistory. Khan Academy. Retrieved March 27, 2013. 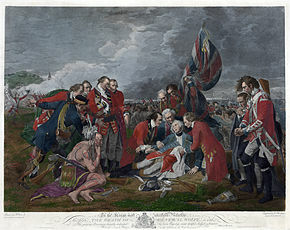 ^ "The National Gallery of Canada: The Death of General Wolfe, 1770". 2015. Retrieved January 5, 2015. ^ Michelle Facos. "Death of General Wolfe". Retrieved January 9, 2015. Montagna, Dennis. "Benjamin West's The Death of General Wolfe: A Nationalist Narrative", American Art Journal (Volume 13, Number 2, 1981): 72–88.